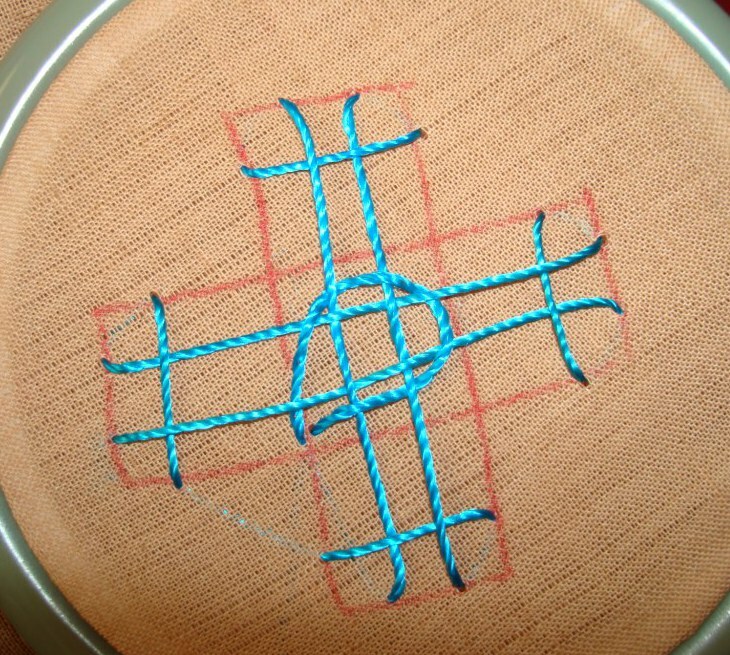 This is kind of woven effect is done with the interlacing stitch over the basic kutch stitch. The patterns are done big for photographic purposes only! 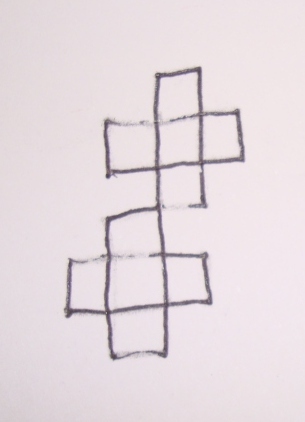 That the threads going above and below can be seen clearly with the spaces in between. Remember , if the pattern is worked like this, it looks ugly! 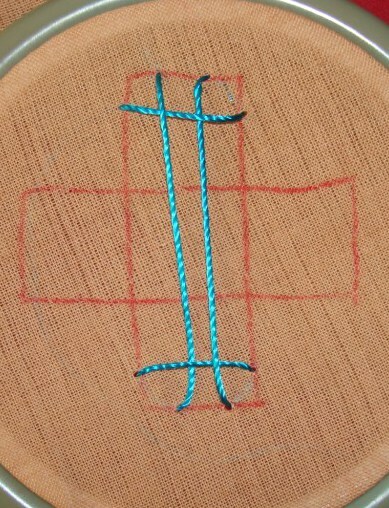 The similarity with the normal stitch ends here. 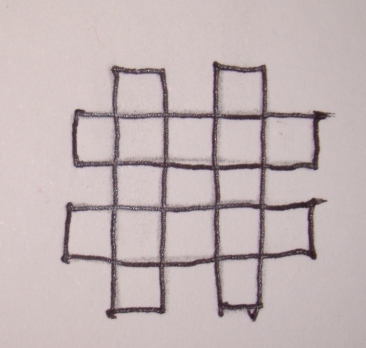 Start at the same point as the normal interlacing stitch, but instead of turning at right angle at the next square, go straight, across the middle space, to the opposite square. 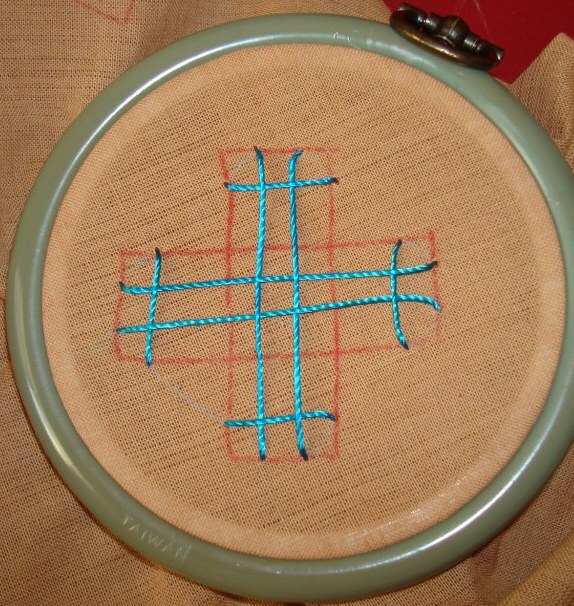 Remember to weave up and down on the base stitch. 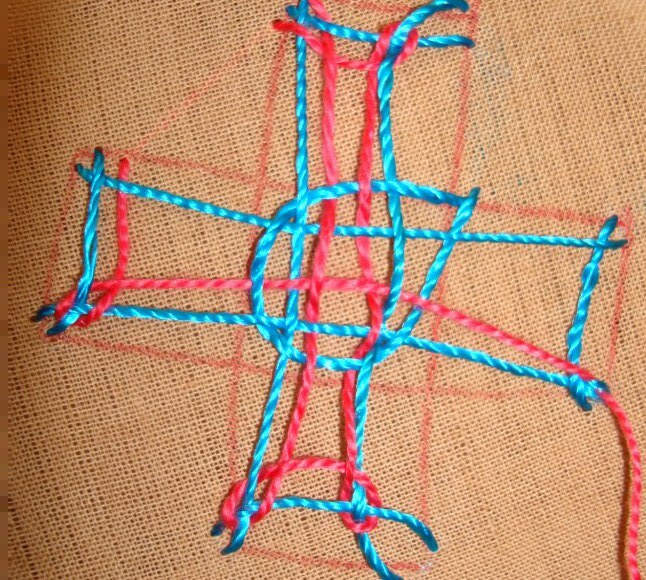 At the opposite end work as normal interlacing stitch , turn twice,and come back, weaving down and up alternatively. 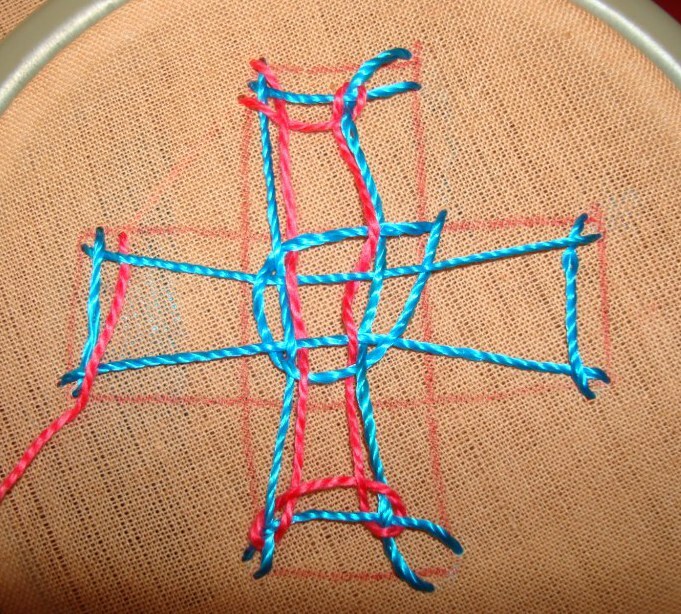 Start as normal interlacing, and work similarly as the vertical interlacing, with one difference, go above and below the vertical interlacing thread too. Thus giving an woven effect. 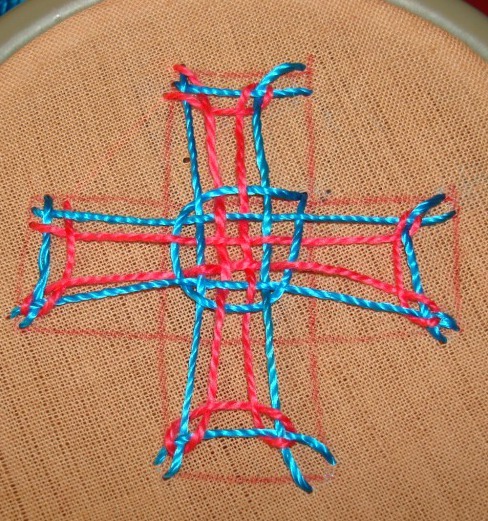 Practice this weaving very well. If you have doubts, don’t hesitate to clarify. 1. Even big patterns can be worked in this method. 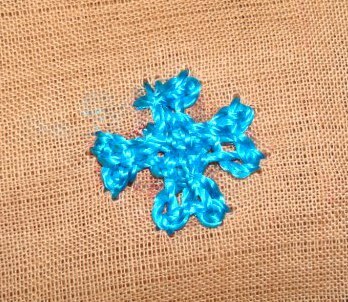 2. the normal and woven method can be alternated. 3. They can used in the same pattern. After some time, If anyone wants I ‘ll post the pictures of the worked sample patterns too. Thanks, Chitra , for all the effort you have put in. The work is interesting. I will try this during the week end and update you. 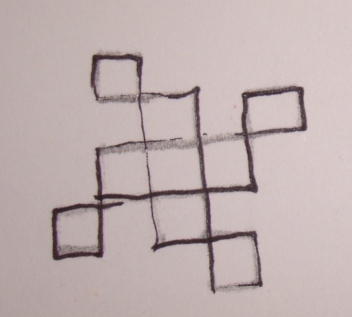 Also, I hope you don’t mind if I borrow some of your geometric designs for use in saris. Pls let me know. Thanks . I don’t mind you using it for personal use. Iam eager to see how you have done so. Please share your projects. Thanks for the patterns. The first one I made out and succeeded as well. Good effort.As I said, only by practicing a particular skill , we can make it our own. Whoohoo! Here we go! I was really looking forward to see this lesson. No words to say Chitra. Big thanks for starting this lesson. Thanks.Though it is there on the blog, practice as much as you can, so that it stays with you for ever. these are very useful. if u can please give details like the previous one. interlacing tutorial isver good. 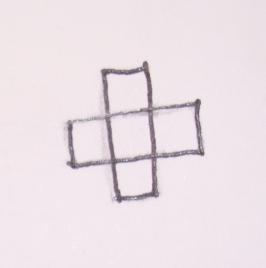 Iam unable to comprehend, I had given tutorial for basic square, Is it drawings you want? please specify. 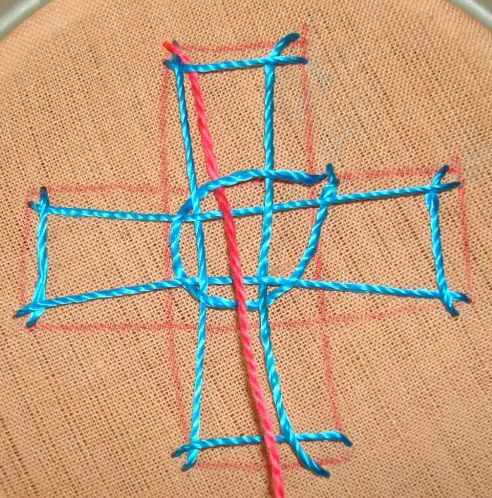 Is it possible to get instructions on how to start and weave the patterns mentioned above. 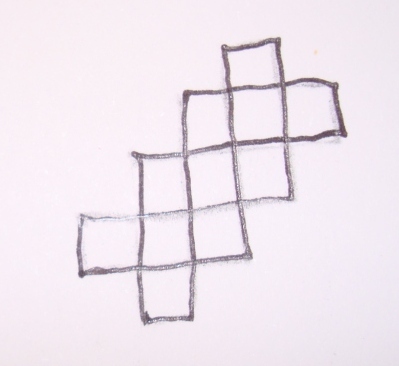 I know how to do the regular kutch pattern. 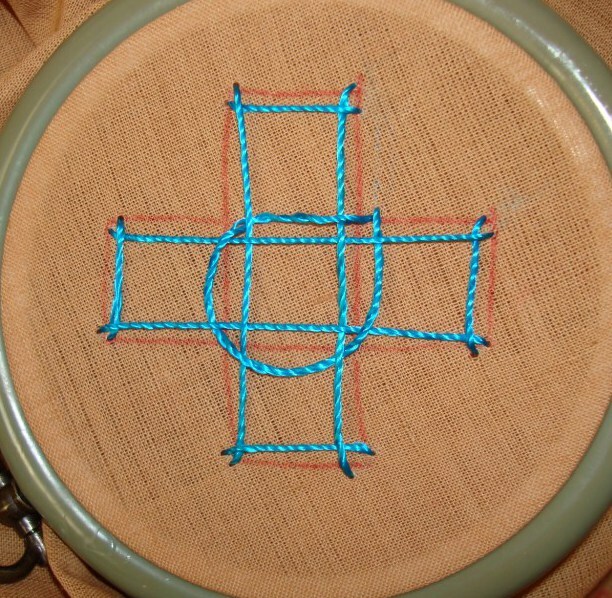 My friend taught me another pattern called round Kutch. I can share round kutch instructions with you. Lakshmi, the pattern explained is the most basic pattern. 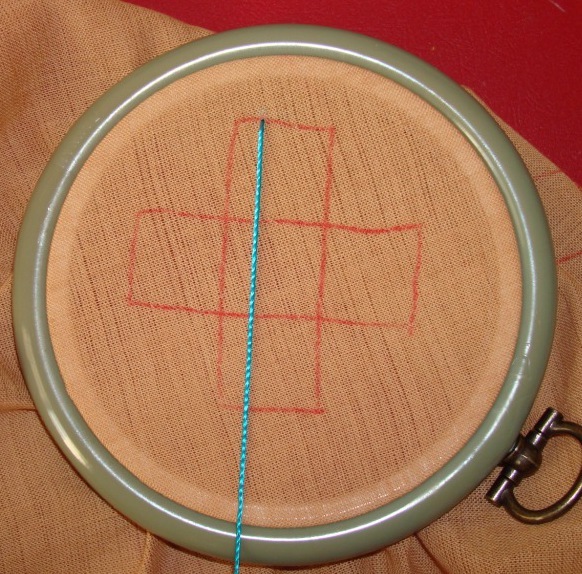 the starting is the same as regular kutch pattern. Try this out, if and when you have doubts , I ‘ll try to help you. 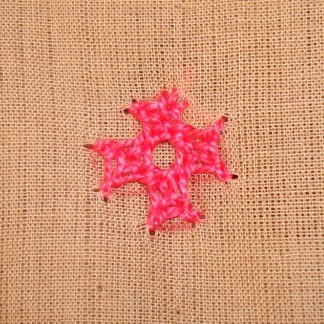 Iam also planning to post some small motifs in woven kutch style . You can try them too.This is the first time I am reading about this round kutch, if you can share the picture, it ‘ll be great. hi mam,thanq for ur patterns,but i’m unable to stich the trail pattern 1,2,&3 please give me some advice to stich them.&please show me that worked pictures. I’ll start working on them and post them soon. I ‘ll finish working on the trial patterns and then get on with the sample pattern.